How can Theresa May have a ‘strong and stable’ government when she’ll give in to anything? MPs announce that the government has won the vote on the Queen’s Speech – by a majority of just 14 votes. Oh yes, the minority Tory government’s almost-nonexistent legislative programme – as laid out in the Queen’s Speech – has been passed by Parliament – but not easily. The Tories – and their bribed accomplices in the DUP – had to promise to allow women from Northern Ireland the right to abortions (admittedly, only if they travel to England or Wales for them) in the face of a Labour amendment that would have defeated them. Doesn’t this indicate that Labour can defeat the pathetically-weak Mrs May at any time, simply by proposing clever amendments to any piece of legislation that might win support from enough Tory backbenchers? 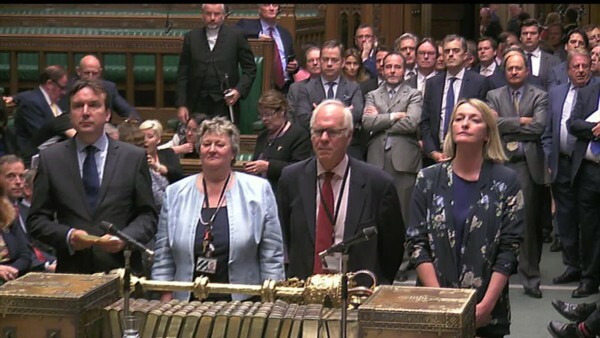 And Labour will do so – not only to gain major concessions from the right-wingers but also because every time the Tories are defeated in this way – and they were defeated on abortions – the public will see that this is a weak administration clinging to government solely to prevent Labour from enacting a truly strong programme of government. I think the Tories know this is an untenable position. Perhaps that is why they have already started advertising for general election campaign organisers – possibly in order to call a new election in August? wish they would get on with it. the suspense is so stressful. like living on a knife edge waiting on where the axe will fall next and how much damage she can do before she has to step down. Hag May isn’t goint to go quieltly. I can’t help wondering whether the main thing making the Tories deperately cling on to power is the complete destruction of the NHS – their holy grail? Michael Portillo reckons that she’ll go after Conference.